The World’s Largest Mallard Duck story is one of those heartwarming stories that make the object of the story (in this case the duck) a must-see stop when you’re passing through a town. The story of the duck is posted on a stand next to the duck, so if you’re driving through Mallard be sure to run over and read the sign. 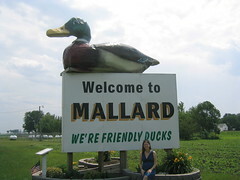 The story follows that the Mallard Community Club wanted a permanent duck float to have in parades throughout the year. The story of the duck’s construction is long and in-depth, but suffice it to say a few members of the club bonded together and built this beauty. The duck is in fact large enough to have someone sitting inside during parades. The duck eventually wound up on the town sign for many years. But like all good roadside Americana went through a rough patch and needed to be refinished. Various fundraisers ensued including a good, old-fashioned pancake breakfast and the necessary monies were raised to restore the duck to its original glory. 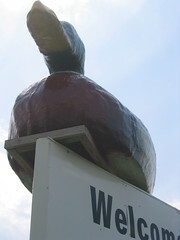 The restoration and repairs were completed in 2004, so the duck is still in great shape and eager to greet you as you pass through town. A must stop and see if you are driving through Iowa and are within a 50 mile range. How often do you see a duck this big? Let me answer that for you, never!